If your goal is to achieve a personalized and unique garden design with craftsman execution, you want to hire Del Conte’s Landscaping. We could not be more pleased. Adam and I love our garden and we spend hours just looking at it. Thanks again for the lovely job. I have been very happy with the great communication and professionalism of all your guys. Please convey my appreciation to all the guys involved in my home project. Del Conte’s Landscaping was a delight to work with. I like there can do attitude! I’m so extremely pleased with everything. Very happy with the results, the yard looks beautiful – better than we expected. The Del Conte team did extraordinary work on our backyard changing it from a wasteland to a family friendly place. 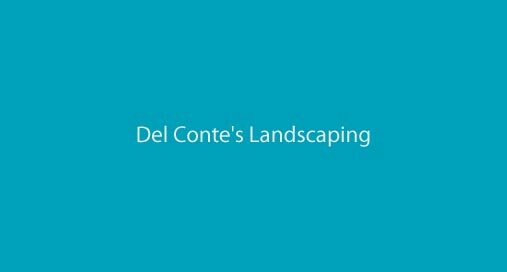 After shopping around for other landscapers, we found that Del Conte’s work far exceeded our expectation at a fair price. We were thoroughly impressed by Eric whose design skills and plant selection transformed our garden into a thing of beauty. The hardscape was beyond our expectations and we love all the comments by neighbors and strangers on how beautiful the design turned out. Del Conte’s Landscaping did a very professional job. The designer and crew were easy and friendly to work with. The finished product has exceeded our expectations. We couldn’t be happier.